Man Carving His Own Destiny, a sculpture chiseled from limestone by Albin Polasek in 1961. Polasek sculpted his first version of Man Carving His Own Destiny while studying under Charles Grafly at the Pennsylvania Academy of Fine Arts in Philadelphia, Pennsylvania, in 1907. 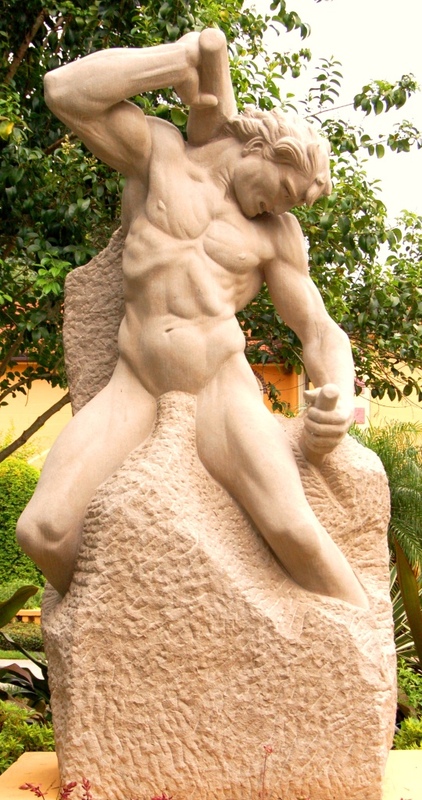 Reminisicent of Michaelangelo's Slaves, the sculpture depicts a man chiseling himself out of stone. Polasek has sculpted 53 different variations of Man Carving His Own Destiny throughout his lifetime. His various recreations depict differences in arm positions, the look of the hair, and how much of the man's body is emerged from the rock. Polasek was born in 1879 in Frenštát pod Radhoštěm, Moravia (now part of the Czech Republic). He apprenticed as a woodcarver in Vienna, Austria, and immigrated to the United States in 1901. After working in the Midwest for nearly four years, Polasek finally began his formal training at the Pennsylvania Academy of Fine Arts in Philadelphia, Pennsylvania. In 1910, Polasek won the Prix de Rome competition, spending three years at the American Academy of Art in Rome, Italy. Once he completed his studies in Rome, Polasek moved to New York City, New York, and set up a studio there. In 1916, the Art Institute of Chicago invited him to head its sculpture department, where he remained for nearly 30 years. In 1949, Polasek retired to Winter Park, Florida, building a home on Lake Osceola. In spite of suffering a stroke in 1950 that left him confined to a wheelchair and his left side paralyzed, Polasek continued to paint, draw, sculpt clay, and carve wood, creating a total of 18 major works before his death in 1965. In 1961, Polasek established the Polasek Foundation, designating his personal galleries, chapel, and gardens as a museum. Each year, thousands of local and international guests come to Winter Park to visit Polasek’s historic home and studio at the Albin Polasek Museum & Sculpture Gardens. Polasek’s works can be found in Europe, all over the United States, and locally in Winter Park and Orlando. Original sculpture: Polasek, Albin. Man Carving His Own Destiny: Albin Polasek Museum & Sculpture Gardens, Winter Park, Florida. Digital reproduction of original sculpture: Polasek, Albin. Man Carving His Own Destiny. Albin Polasek Museum & Sculpture Gardens, Winter Park, Florida. Originally created by Albin Polasek. Copyright to this resource is held by Albin Polasek and is provided here by RICHES of Central Florida for educational purposes only. "ALBIN POLASEK BIOGRAPHY." Albin Polasek Museum & Sculpture Gardens. http://www.polasek.org/about/albin-polasek-biography/. Polasek, Emily M. K., and Albin Polasek. Albin Polasek: Man Carving His Own Destiny. 1970. Sherwood, Ruth. Carving His Own Destiny: The Story of Albin Polášek. Chicago: R.F. Seymour, 1954. 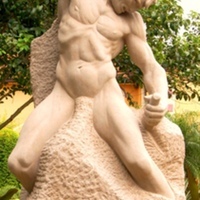 “Man Carving His Own Destiny by Albin Polasek.” RICHES of Central Florida accessed April 26, 2019, https://richesmi.cah.ucf.edu/omeka/items/show/5517.